PITTSBURG -- For years, Pittsburg police have used surveillance cameras that display real-time videos on computers to help fight crime. Now, that same footage can also be viewed by officers on the small screen of their smartphones. Before police started using the smartphone application at the beginning of the year, footage had to be viewed on computers or in a monitoring room inside the police department. Viewing the footage on a smartphone frees officers from having to be in a fixed location to look at surveillance video recorded by 86 cameras placed in public locations that include intersections, gas stations and parks throughout the city. "Our officers are on the street over 90 percent of the time. Their office is their patrol car. So being able to give them this app as a resource to use on their own device is huge," Lt. Ron Raman said. "Our city is utilizing technology that is available to help our officers remain safe, our community remain safe, and to arrest criminals." While surveillance video can be viewed in patrol car computers, officers prefer to leave them free for law-enforcement communications, such as running license plates and checking on warrants. Many Bay Area police departments are using surveillance cameras to deter crime by providing real-time monitoring of areas, record crimes in progress, and help police make decisions when deploying resources before they arrive at the scene. Recorded footage of criminal activity can provide leads for police to follow and used in court cases. Some locations where cameras are located have signs letting people know the area is under video surveillance, but that is not always the case. 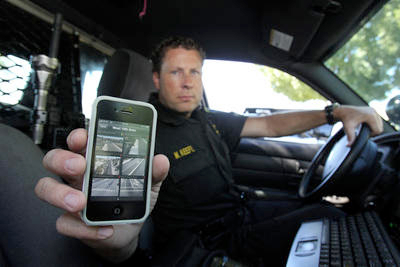 Smartphones provide officers with the means to check on an area that is miles away or just around the corner while on patrol either on foot on in a vehicle. 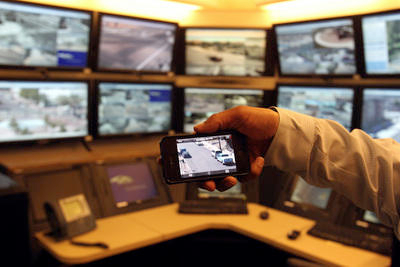 The same capabilities of being able to zoom in and zoom out of real-time and previously recorded footage that exists on computer screens or in the monitoring room also applies to the smart phone application. Patrol officer Mike Keefe is among those using the application, which requires a password to log into the department's secure network. "I think the most powerful tool for law enforcement is being able to be proactive. If you are reactive, you're not preventing crime. What the cameras allow you to do is be proactive," said Keefe while on patrol earlier this week. "In any city, a lot of drug transactions take place at gas stations," said Keefe, who has been instrumental in helping the department with its video surveillance strategy. "We can back up around the corner and watch a gas station if we like. If we see what we believe to be suspicious activity, we can then investigate it further when the car pulls away." The department first installed video surveillance cameras in 2005. Over the years, many of the cameras have been funded by Department of Homeland Security grants. Pittsburg police use a network of cameras engineered and installed by Odin Systems Inc., a San Diego-based provider of video surveillance systems to law enforcement agencies. Odin uses a video surveillance management software system developed by Denmark-based Milestone Systems that includes a recent addition of the smartphone application. "As of right now, Pittsburg has the most comprehensive surveillance system in Contra Costa County, if not all of Northern California," said Dustin Saylor, chief executive officer of Odin Systems. Keefe recalled an arrest he made that was helped by viewing real-time footage with his smartphone of an individual at a bus stop who reached into a pocket and pulled out a glass pipe and began smoking rock cocaine. "I sent an officer en route and watched until the officer got there to make sure (the individual) didn't discard it," he said. "Once the officer was there, they detained the individual, then I came over knowing (the individual) didn't discard anything and I located a sack of rock cocaine and a pipe."